Today we face a climate of ever increasing misdirection by popular media. This site, along with others, aims to reveal the reality of America and the loss of fact inherent to the over riding theme of our current political and social confusion: Purposeful deception. The Economists concede that economics is an inexact science. What does that mean? Perhaps it means their economic forecast is better than yours or mine. Recently, economic indicators have been rising and people have their fingers crossed. Economists have given us reason to hope that the job market will improve and that the stock market will continue on a steady climb. Yet, the newspapers continue to report more layoffs and more jobs going overseas. Needless poverty, unemployment, inflation, the threat of depression, taxes, crimes related to profit (sale of illicit drugs, stolen IDs, muggings, bribery, con artists, etc. ), conflict of interest, endless red tape, a staggering national debt plus a widening budget deficit, 48 out of 50 states in debt, cities in debt, counties in debt, skyrocketing personal debts, 50% of Americans unhappy at their work, saving for retirement and our children's education, health being a matter of wealth, competing in the "rat race", the need for insurance, being a nation of litigation, being subject to the tremors on Wall Street, fear of downsizing and automation, fear of more Enrons, outsourcing, bankruptcies, crippling strikes, materialism, corruption, welfare, social security, sacrificing quality and safety in our products for the sake of profit, the social problem of the "haves" vs. the "havenots" and the inevitable family quarrels over money. Have we become gluttons for punishment? My college professor once said, "You can get used to hanging if you live long enough!" We Americans love our freedom; yet, we have allowed the use of money to completely dominate our way of life. Indeed, we are no longer a free people. We are 7.4 trillion dollars in debt. We live in fear of depression, inflation, inadequate medical coverage and losing our jobs. Our freedom is at stake if not our very survival. Yet, we put our collective heads in the sand. Yes, there is something we can do. We can look into ourselves for an answer. We may find that we have the strength to carry out our internal economic affairs without the need to use money. Yes, we will still need to use money when dealing with other countries. There is no question that a way of life without money will alleviate if not completely eliminate all of the previously mentioned problems. Yet, we scoff at the idea. We are totally convinced that money is a necessity. We cannot imagine life without money. Perhaps the time has come to think otherwise. It is completely obvious our present economy no longer satisfies our present day needs. Can we learn to distribute our goods and services according to need (on an ongoing basis) rather than by the ability to pay? Why not? Poverty and materialism will be eliminated! Our sense of value will change. Wealth will no longer be a status symbol. A man will be judged by what he is; not by what he has. He will be judged by his achievements, leadership, ideas, artistic endeavours or athletic prowess; not by the size of his wallet. Yes, everything will be free according to need. All the necessities and common luxuries will be available on a help yourself basis at the local store. Surely, this country is capable of supplying the necessities and common luxuries for everyone in this country many times over. The more "expensive" items, such as housing, cars, boats, etc. would be provided for on a priority basis. For example, the homeless would be given housing ahead of those living in crowded quarters. How will this priority be established? Perhaps a local board elected by the people in the neighborhood such as a school board. Or perhaps the school boards could absorb this responsibility in addition to their present duties. Since cooperation will replace competition, can government, industry and the people learn to work together as a team to meet the economic needs of our nation as well as each individual? Again, why not? Yes, competition is great; but cooperation is even better. Cooperation avoids duplication of effort. Wouldn't it be more efficient to have everybody freely working together, sharing ideas, thoughts and technical knowledge? Patents and industrial secrets would be a thing of the past. Competition, however, will still be around. Individuals will still compete with their co-workers in ideas, achievements, leadership and getting promotions. Today, only 50% of Americans enjoy their work. That will change. In a way of life without money, we will all be free to do the work we want to do or even love to do without any economic fear. We will be free to pursue our passion or as Joseph Campbell suggests we "follow our bliss". Cooperation will replace wasteful competition. We will all work together as a team. Work will become a way to help people, to meet people or to be part of something meaningful. It is a proven fact that people like to help one another. An esprit de corps will naturally build up and make work more enjoyable. Even the most menial task becomes easier when people work together. Yes, work will become more of a "togetherness" thing. The profit motive will no longer be a hindrance to efficiency. There will be no need to sacrifice quality and safety in our products for the sake of profit. We will, like in the olden days, take pride in our work. Yes, there is very likely to be a shortage of people volunteering to do the more menial tasks. One option is to offer "perks". A perk can be of various forms such as front row season tickets to the opera or to his or her favorite sports team. Can you imagine an NBA basketball game where the celebrities are sitting in the back rows while the dishwashers and janitors are at courtside? (My apologies to Spike Lee & Jack Nicholson!) Or the perk could be the latest model boat or sports car which would not be immediately available to the public. Another option is to draft everyone once in their lifetime, to do a half year or so stint at a menial task. Perhaps a humbling experience is in order for all of us. It might serve us well in the area of character building. Also, consider the fact that perhaps millions of people will be freed from jobs associated with the use of money. Millions more that are now unemployed or on welfare will also be available to help fill the labor needs of our country. Thus, we will have the work force necessary to do the work which is not economically feasible in our present economy such as cleaning our environment (land, sea & air), conservation, recycling, humanitarian work, research in medicine, education, science & space and now we can include national security. Perhaps the most difficult problem is in the administration of a way of life without money. Can we learn to determine our economic needs, allocate our resources from the federal on down to the neighborhood levels? Perhaps some sort of economic bodies must be created to coordinate, monitor and carryout our economic needs. These economic bodies would exist similar to our governments, one for the federal, one for each state and one for each local level. Yes, in order to administrate a way of life without money, economic bodies, boards or councils or whatever you wish to call them would be created to absorb economic responsibility from our various governments. They will interact and cooperate with one another to meet the economic needs of our country and of each individual. They will be empowered by Congress to tend to the economic needs of its constituents. Thus, a balance of power will be safely maintained. Our federal needs, which would be similar to the federal budget we have today, will be resolved by an economic body comprised of representatives of the various branches of government, our industrial & labor resources, research (in medicine, education, science & space), our environment, conservation, importing & exporting, and now, national security and whatever facet of our way of life should be represented. This economic body will arrange for the labor and material resources necessary to meet the economic needs of our nation. Similarly, the same will occur at the state and local levels. The economic body at the local levels will be responsible for providing services to the people in the neighborhood. If the labor needs cannot be met with volunteer workers, "perks" must be offered. Also, the economic body at the local levels will be responsible for keeping the stores stocked with food, clothing and the common luxuries which will be available free. Thus, the economic needs of the nation right on down to the neighborhood levels would be determined and satisfied by these economic bodies. How much economic responsibility will these new bodies absorb from our federal, state and local governments? How much will be shared? Can a balance of power be maintained? At any rate, our federal, state and local governments will be relieved of considerable amount of economic responsibility. Thus, our various governments will be free to catch up on all the other domestic and foreign issues that face us. Yes, we will still import and export goods with foreign countries as our needs dictate; but what money will be used in place of the almighty dollar? 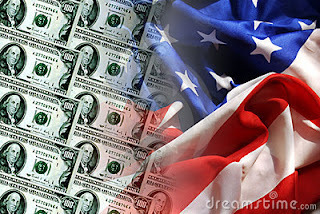 Would the dollar have any value if everything is free in the USA? Would that be a problem? We would, however, still be able to use the currency of the country we are doing business with. For example, if we export goods to Germany, we would accept marks or euros in payment. The euros would then be deposited in our national treasury for future use. The money could then be used to import goods or perhaps send Americans overseas on vacation. Yes, a way of life without money could be compared to the kibbutz which now exist in Israel. Can you picture the USA as one big kibbutz? However, ownership of property will remain the same as it is today. Our government will remain the same. Our free enterprise system will remain in place as it is today. There will be no need for money or any substitute for money since everything will be free. The advantages of a way of life without money stagger the imagination; but they are real and cannot be disputed. Perhaps it is time for us to grab the brass ring? I want to hear from you but any comment that advocates violence, illegal activity or that contains advertisements that do not promote activism or awareness, will be deleted. Educate and inform the whole mass of the people... They are the only sure reliance for the preservation of our liberty. 2011: "Dissent is what Rescues Democracy"
Why Does the Government Ignore Our Wishes? Veterans Want You for Civil Resistance! American Nationalism: Is Our Freedom Under Attack? Communists Are Taking Over Wall Street? We the People Support Occupy Wall Street; Why Doesn’t Congress? Will Our Nation Experience Another Kent State? U.S. Encouraged Gun Sales to Drug Cartels, 70% of Seized Mexico Guns Are from U.S.
Is the U.S. a Fascist Police-State? Why Worry About Total Surveillance When You're Just An Ordinary Joe? Ties to Ukrainian National a Unifying Theme in Early Attacks on Trump - The article is a comprehensive investigation into DNC ties to Ukrainian nationals. Gen. McCaffrey: U.S. natl. security process is broken under Trump - Retired Four-Star General Barry McCaffrey reacts to Trump's criticism of military leaders and claim he could have been a good general, himself. This blog is for educational value only and neither represents nor advocates social or political dissension lest it be in a peaceful, intelligent manner through the legal rights granted to us by the U.S. Constitution.